Man Proposes, But God Disposes – End-Time Handmaidens and Servants Intl. A fast-moving winter storm blanketed Jerusalem and Northern Israel with snow, hail and copious amounts of rain. News sources posted photographs of the Western Wall plaza, Judaism’s holiest site covered in snow. Thunder also sounded and hail fell over the city. It was for many a night to remember. A total of four inches of the “white stuff” fell, but due to the ground being warm, it soon disappeared. The Israeli Electrical Corporation also announced that a new “record” for winter electrical usage had been set, as most Israelis use electrical heaters to stay warm. Israel has been in a severe drought for the last five years, but this winter’s rains have appeared to have brought an end to the dryness. The Lake of Galilee is up some five inches but it still needs more than 15 feet of water to reach capacity. In the opening scripture to this Prayer Letter as well as all of Chapter 38, God speaks to Job about His own sovereignty over creation, time and over all the peoples of the earth. The phrase, “the time of trouble” speaks of times of distress, and of battle and war. This phrase also references the forthcoming times of tribulation (Jer. 30:7, Obad. 1:14, Joel 2:11). God uses the “elements” to hide his people and send forth his judgments. He sent hail to judge Pharaoh (Ex. 9:25). The LORD will also use hail in future judgments: the “refuge of lies” mentioned in Isaiah will be destroyed because of the hail (Is. 28:17). Revelation speaks of great hailstones falling from heaven, causing people to curse God (Rev. 16:21). Snow is mentioned in the Bible twenty-four times, (21 times in the O.T. and 3 in the N.T.). The Hebrew word for “treasures” also can mean “storehouses.” Snow comes from God’s treasure house. Psalms declares that He “scattered the kings in it, when snow was in Salmon” (Ps. 68:14). Snow represents purity and beauty. It covers what is ugly and desolate, hiding trash and dirt and making as it were “all things beautiful.” Similarly, snow reminds us how God through the shed blood of Jesus can take the worst sinner and make him or her as “white as snow” (Is. 1:18). David implores the LORD to “wash me and I shall be whiter than snow” (Ps. 51:7). Mark seeing Jesus transfigured records that his clothes: “became shining, exceeding white as snow.” John saw the risen Jesus appearing before him with “his head and his hair being like wool, and “as white as snow.” He is the spotless Lamb (I Pet. 1:18-19). Pray for Israel to continue to have a wet season. Pray that the rains from heaven would continue, so that the aquifers and the lake of Galilee would be filled. Pray that the LORD would continue to shelter his people during times of trouble. Pray that He who rules the heavens, would use the elements to “scatter the kings” who desire to wage war against Israel. Israeli news sources revealed crucial elements of President Trump’s much heralded future Middle East peace plan. Last year President Trump declared that if both Israel and Palestine agreed to this plan’s implementation, it would be “the deal of the century.” The plan, details of which have been a closely guarded secret for months, also calls for a land swap for the land that Israel will annex, though the ratio of the swap was not immediately clear, according to the report. Regarding Jerusalem, the report stated that the city would be divided, with West Jerusalem and some areas of East Jerusalem being the capital of Israel, and East Jerusalem – including most of the Arab neighborhoods – being the capital of a Palestinian state. Israel would retain sovereignty over the Old City and its immediate environs, the Temple Mount and the Western Wall, but it would be administered together with the Palestinians, Jordanians, and perhaps other countries. The report said that the White House expectation was for the Palestinians to reject the plan when it is presented, but for Israel to give a positive response. The Palestinians, who have cut off ties with the US, have said that they would reject any plan Trump would put forward. If the report about the contours of the plan is accurate, the amount of land that would make up the Palestinian state is more than double Areas A and B, where the Palestinians today have control, but less than what Ehud Olmert offered Palestinian Authority President Mahmoud Abbas in 2008, which he rejected. Former Israeli Prime Minister Olmert offered a near-total withdrawal from the West Bank, proposing that Israel only keep 6.3% of Judea and Samaria to incorporate the large settlement blocs, and compensate the Palestinians with Israeli land equivalent to 5.8% of the West Bank. He also proposed putting the Old City and the holy sites under international control. A senior White House official said in response to the report, “As in the past, speculation with regards to the content of the plan is not accurate. We have no further comment.” An official in the Prime Minister’s Office said it had “nothing to offer” on the news report. Beit El Council head Shai Alon said, “The US president has achieved many things. He was the first [president] to transfer the US Embassy to Jerusalem and to recognize our rights to the Holy City. But his solution to the conflict with the Palestinians, as it was revealed this evening, is filled with holes, and of course we oppose it.” Alon rejected any talk of dividing Jerusalem. “We didn’t return to Jerusalem after thousands of years of exile, so that a Jordanian guard would inspect us at the entrance to the Western Wall” (www.jpost.com). The Palestinian Authority said on Wednesday that “any peace plan that does not include an independent Palestinian state – with all of East Jerusalem as its capital – on the 1967 borders, is destined to fail.” The PA was responding to a report first released by Israel television channel 13, which claimed that US President Donald Trump’s “deal of the century” will include a Palestinian state on 85% – 90% of the West Bank and some parts of East Jerusalem. Thomas Kempis, a medieval writer who wrote the devotional The Imitations of Christ , stated that while man proposes, God in the end disposes. In other words, people can make plans but it is God who determines how things will turn out. Kempis’ counsel is reflected in Scripture. Proverbs declares “There are many devices in a man’s heart, nevertheless the counsel of the LORD shall stand” (Pr. 19:21). Past American Presidents, as well as other great leaders of the world and the United Nations, have all tried to make lasting peace in the Middle East. Past failed peace plans and accords fill the dustbins of history. There will be no true and lasting peace until the Prince of Peace returns with a rod of iron in His hand to rule the nations. The LORD God is also resolute in His counsel to the nations. They need to heed His adjuring word concerning Israel: “I will also gather all nations and will bring them down into the valley of Jehoshaphat and will plead with them there for my people and for my heritage Israel whom they have scattered among the nations and parted my land.” In other words, nations and leaders who by the force of their diplomacy or military power try to divide the land will find themselves severely judged by the LORD God. Israel is God’s land. Newly elected Democratic Congresswoman from Minnesota, Ilhan Omar, secured a seat on the House Foreign Affairs Committee this week. A former Somalian refugee, she is one of two Muslim women elected to Congress. Within the very hour of her appointment, Omar referred to Israel as a “regime.” In an interview with CNN, the lawmaker claimed that “Israel has hypnotized the world,” and appealed to Allah to “awaken the people and help them see the evil doings of Israel” (www.jpost.com 1/17/2019). God told Abraham regarding the Jewish people that “I will bless them that bless thee, and curse him that curseth thee” (Gen. 12a). Pray for her soul. Jesus said “Love your enemies, bless them that curse you, do good to them that hate you and pray for them that despitefully use you and persecute you” (Mt. 5:44). The Gaza Strip is home to some two million people and borders Southern Israel and Egypt’s Northern Sinai. Hamas, an Iranian supported terrorist group, controls the entire coastal enclave. These “leaders” have sought ways to make life miserable for Israelis. Communities that border the Gaza Strip have been subjected to weekly riots along the border fences, secret cross border tunnels capable of sending terrorists into Israel, waste discharged into the ocean, polluting Israel’s beaches, scuba terrorists from the sea, fire balloons, drones, missiles, and now sewage. Raw wastewater and sewage from Gaza is being pumped into southern Israeli streams, and garbage is being amassed along the Israeli border fence, causing an ecological nightmare and the suffering of residents near the border (www.ynetnews.com ). The report stated that polluted sewage is being pumped from the Gaza cities of Beit Hanoun and Beit Lahia into Nahal Hanun, which travels through Israel before emptying out into the Mediterranean Sea. In the process, Israeli groundwater is being polluted, and causing an invasion of mosquitoes and flies in the moshavim and kibbutzim adjacent to Gaza. Due to the difficult conditions, Israel’s Water Authority has established a pumping station near the Erez border crossing and begun to purify the water. Three giant landfills have also been set up by the Hamas government bordering Southern Israel, causing the smell of trash to spread into the Jewish communities. Residents reported that the landfills are periodically lit on fire, causing the release of dangerous chemicals into the air. Insects and rodents are also breeding in the landfills and then infesting the communities, along with disease-ridden cats and dogs that breach the fence and scavenge in the garbage. These pollutants also contaminate the soil and crops which grow in Israel thereby ruining their market value and endangering those who consume them. The situation comes after months of incendiary balloon and kite attacks by Gazans which have burned thousands of acres of agricultural, residential, and protected nature lands, causing millions of dollars in damage. Additionally, in 2018, approximately 330 rockets were fired from Gaza into southern Israeli communities. Please pray. God knows the solution to these problems, even when we feel they are impossible to solve. Zephaniah declares: “Woe to the inhabitants of the sea coast….For Gaza shall be forsaken…and the sea coast shall be dwellings and cottages for shepherds and folds for flocks” (Zeph 2:4-7). Please pray for the communities along Israel’s borders with Gaza. May those who live there find rest, peace, and restoration. Pray David’s word in Psalms: “Let them be confounded and turned back that hate Zion” (Ps. 129:5). Also, for those who live in the effected border communities, pray Psalm 126, a Psalm of restoration. Pray: “The LORD hath done great things for us: whereof we are glad, Turn again our captivity, O LORD, as the streams in the south. They that sow in tears shall reap in joy” (Ps. 126:3-5). 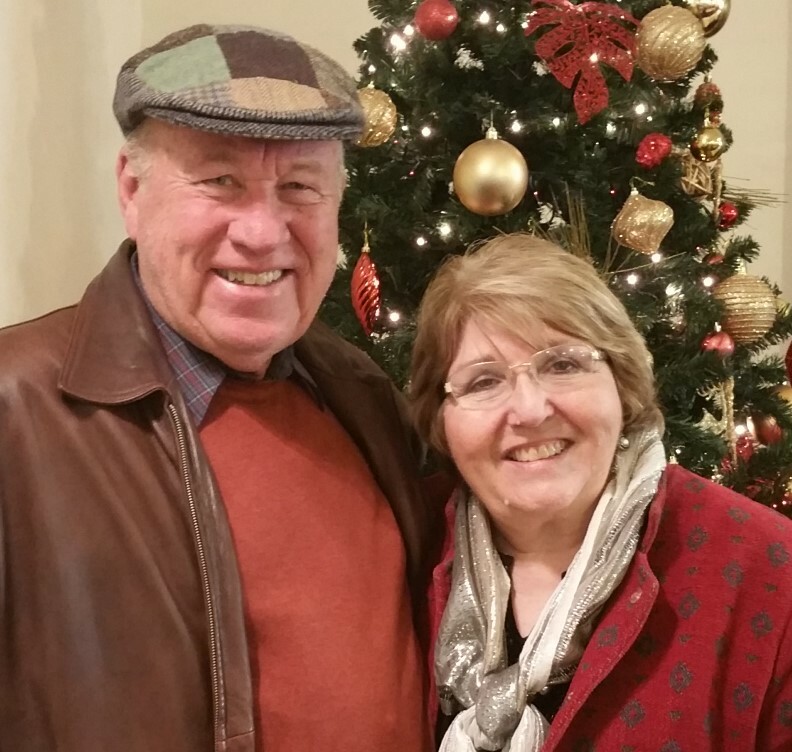 Our beloved Peter and Margaret Jones from the U.K. are once again back in the land and hosting the House of Peace. We thank them for being such a blessing to the Body of Christ. The HOP also hosts Wednesday afternoon prayer and intercession. If you are in Jerusalem, please come by and join us in prayer.